Anyone trying to learn how to dig up ancient artifacts by watching the Tomb Raider movies would find little practical help from Angelina Jolie traipsing around Cambodia's temples. If you're an online-literature buff in China, you might have better luck. Last spring, an unemployed 45-year-old man and his seven accomplices were arrested by police after having successfully dug up artifacts from a 15th century tomb just outside Beijing. Their techniques, as the police soon found out, were an exact imitation of those described in Ghost Blows Out the Light, a hugely popular Chinese online novel that was first published on the Web in December 2005 and has since been read by millions. A soft-spoken 34-year-old, Hou studied Chinese literature while at university in Beijing and worked as an editor at Sina.com, a major Chinese Web portal, for seven years before starting Shanda in 2005. He describes the company  in which budding writers self-publish their work without having to be vetted by editors  as not only a profitable business, but also an extension of his own literary aspirations. "I believe everyone can be a writer," he says. "Especially now, when the Internet really has become part of our lives." The tradition of online literature in China, Hou and other writers say, goes back to the mid-'90s, when the bulletin-board system, or BBS, first appeared on the Chinese Internet as a platform to share opinions and in many cases literary creations. "I still recall my astonishment when I read my first online novel some 15 years ago on a BBS," says Zhang Kangkang, a renowned novelist and vice chairwoman of the Chinese Writers Association. "It was then that I realized how serious and creative the so-called online literature can be." Although largely substituted now by social-networking sites like Facebook and Twitter in the West, the BBS still prevails in China today as a relatively free place to express dissidence, while no such leeway is allowed in the traditional media. 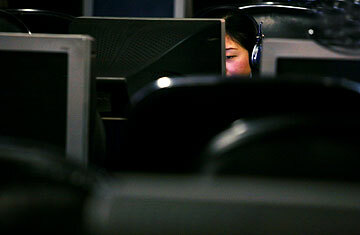 The same rigid censorship that drove millions of users to BBS and other online forums likely also ushered many book readers into cyberspace. "All books are required to go through three rounds of government-supervised editing, which could take months, before they can be published on the mainland," says Zhang. "Whereas online novels almost instantly reach the public at the click of a button." Although most BBS-based online novels started out free of charge, Shanda Literature's users now have to pay for the pleasure of online reading. But for most subscribers, the cost is minimal: they can access up to 75% of a book for free and pay only about 0.04 yuan (less than one cent) per 1,000 words for the rest of the book. In other words, it costs about one-tenth of the paperback price to read a book online. Right now, the company takes half of the readers' payment, and the other half goes into the writers' pocket. As the seemingly negligible amount paid by readers still takes up a major part of the company's revenue, Hou says a growing trend in the business is to convert online postings into hard copies of books, plays, movies or even computer games. Ghost Blows Out the Light, whose book and online game versions both became best sellers, already has a movie and a play in the making. More recently, a Shanda fantasy novel called The Star Games just sold its online game rights for 1 million yuan in January. "A major part of our job now is to forage those online-novel websites for potential book ideas," says Xiang Zhuwei, the Beijing-based publisher of Ghost Blows Out the Light. "And I believe it's the same with other major publishers too." Shanda also expects to tap into China's increasing trend of cell-phone reading and has a social-networking site in the pipeline to try to build a steady user base. Still, Hou realizes that to expand readership further in the long term, it may not be enough to rely solely on amateur writers and their largely similar tomb-raider or martial-arts novels. "We have been in talks with big-name writers like Yu Hua as well," says the CEO. "We will be much more comprehensive than we are now."